This weekend reached temps of a cool 106 degrees. Fur realz. to dealing with the heat. Easy breezy. P.S. 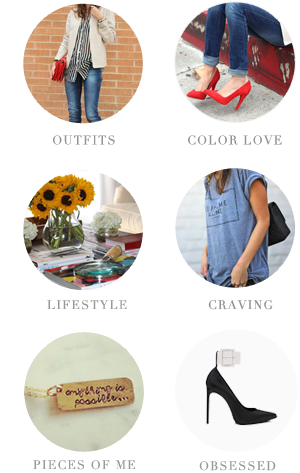 Was so honored to be The Zoe Report's blogger crush of the week! Love the colour of this shirt! Congratulations on the Zoe Report! That necklace is bananas! Seriously I am not just saying this Nicole..look at my post today I am wearing the same friggin' dress in black by A. Wang and I am wearing it open.. SERIOUSLY..CRAZY NO? I am loving that color! That's an amazing feature - and super well-deserved! I love how you styled this outfit, that purple shade is really stunning. Love this purple dress! It looks great over jeans. Love your hair that way too. You so fine. Also, major on the zoe report. Go you! I love that shirt. Unfortunately, I am so short and can't pull long things off like that, but you wear it well! HOLY CRAP that necklace and top knot - SO PERFECT!!! And I guess you guys borrowed our hot weather - and I WANT IT BACK! It was only 65 this morning, so not cool! Gorgeous colors...LOVE that necklace! And you SO deserved that feature! Wow love how you paired this dress as a top great colors! That is such a pretty color! I love the simplicity and ease of this. Simple yet chic, love it! This color purple looks STUNNING on you!! i love that you are wearing a dress as a vest! stunning as always! such a beautiful colour, I love that dress! The heels, the sunnies, all so chic. You look gorgeous! I love this outfit. I give you props for sporting this in such crazy temperatures. Congrats on the feature! that is seriously so amazing! I love your hair in that bun and every item from your shop is amazing how ever you style it! Looking lovely..and loving the dress open as a cardi! Looks beautiful. Stay cool. 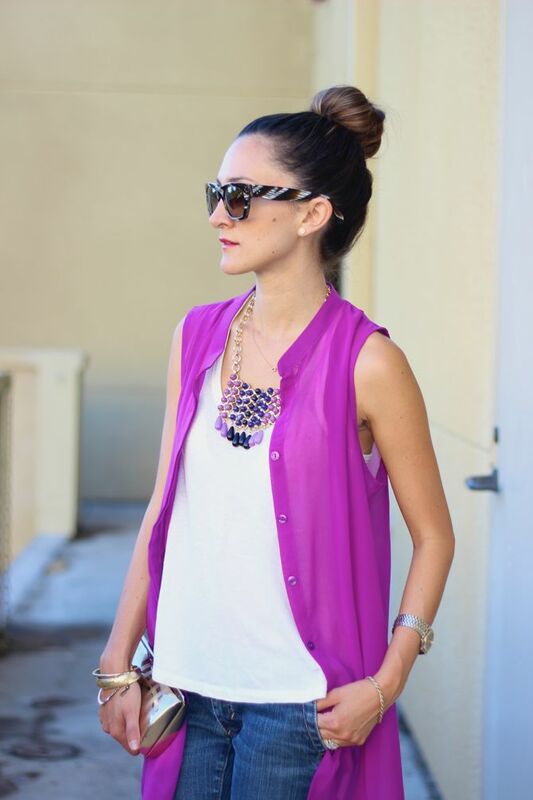 Gorgeous color in the top and necklace! 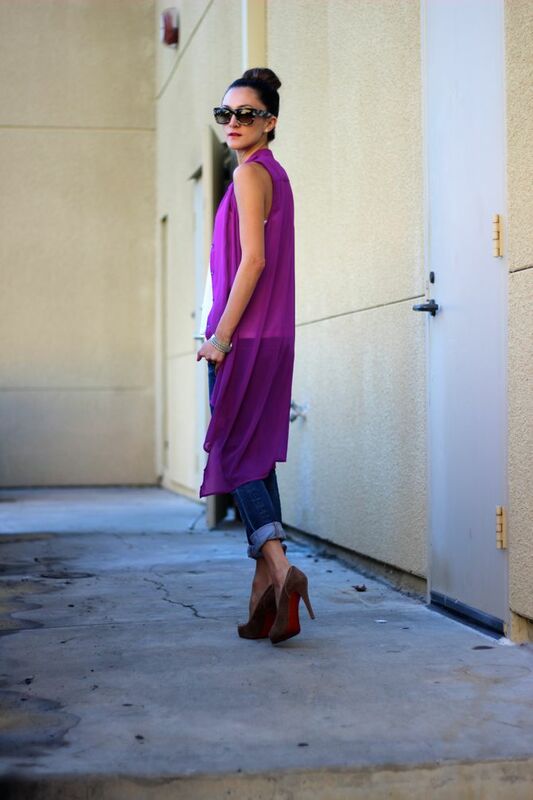 love how you've styled this dress! the outfit is amazing, but I LOVE your hair like that! so pretty Nicole!! I just love that vibrant colour. Adore your hair like this! Congrats on the The Zoe Report feature :) Go you! Gorgeous dress. I love how you wore it as a vest.